Read a Q&A with Justin in HR Magazine's Book Blog. Read Justin's conversation with Tony Zamora during #SHRM18. Learn how your veteran employees can help make your organization a military-ready work environment. A quarter of a million service members transition from the military each year to the civilian workforce, and though much has been written, studied, and researched about the challenges of employing veterans, bridging the divide between the “We Will” environment of the military and the “At Will” reality of the private sector can be daunting. 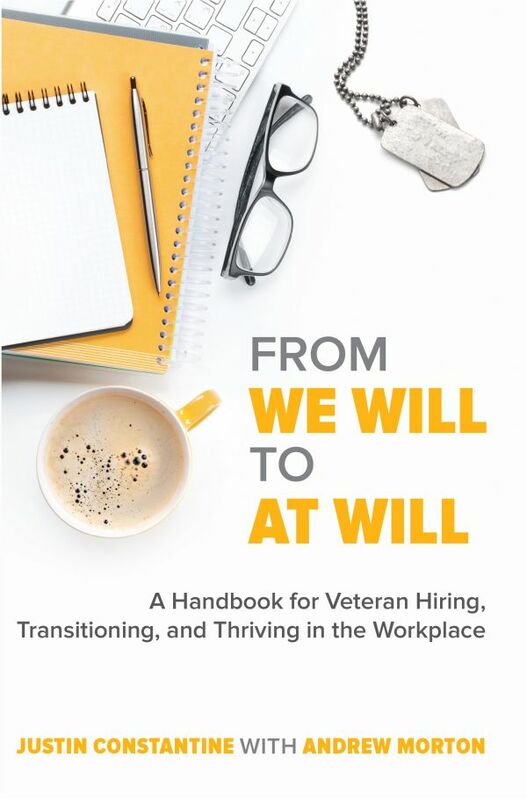 With expert recommendations and insights, real-world case studies, and state-of-the-art resources and tools, From WE WILL to AT WILL demystifies the culture and mind-set of today’s veterans, presents the business case for hiring veterans, shows how to manage the hiring process, and provides a clear road-map to navigate the path from veteran-friendly to veteran-ready. “I know the value our veterans and military spouses bring to the workplace, and Justin skillfully communicates that message to HR professionals across all industries and effectively bridges the gap to veteran hiring, career development, and growth.” — Joseph M. DePinto, President & CEO, 7-Eleven, Inc.
Justin Constantine retired from the US Marine Corps at the rank of lieutenant colonel and is now an inspirational speaker and veteran advocate. He speaks at numerous corporate, educational, and military institutions about leadership, the upside of change, teamwork, and overcoming adversity.